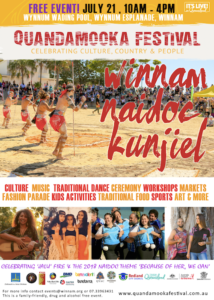 On Saturday 21st July the (drained) Wynnum Wading Pool and surrounding park will transform into a day of fun and celebration of the local Quandamooka people. 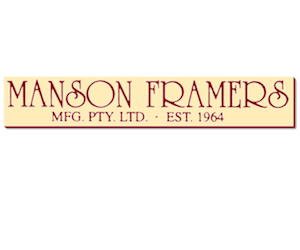 The event is part of NAIDOC Week (8th-15th July) and the Quandamooka Festival (1st June-31st August). NAIDOC stands for ‘National Aboriginal and Islanders Day of Observance Committee’ and the word Kunjiel means ‘corroboree‘. 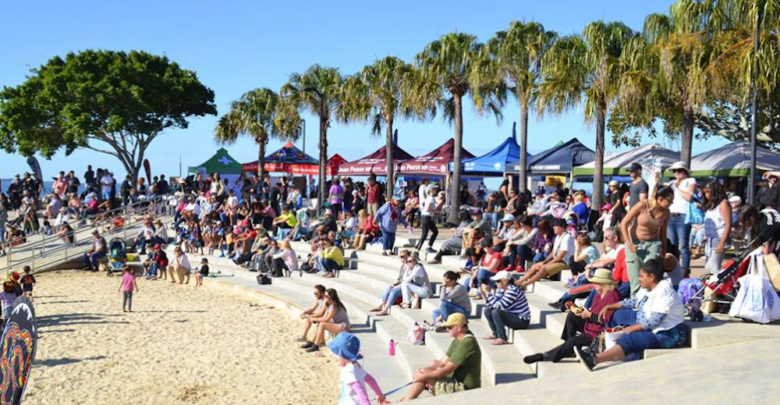 Organised by the local Winnam Aboriginal and Torres Strait Islander Corporation, the day will feature music, market stalls, art and craft and activities for the family and the kids. The Deadly Choices Traditional Games will be held along with traditional dance and storytelling by First Nation language groups. Last year the event attracted around 2,500 attendees. Winnam NAIDOC/Kunjiel Family Fun Day will run from 10am-4pm and will be family friendly, environmentally friendly, and drug and alcohol free.